For other uses, see Peony (disambiguation). The peony or paeony is a flowering plant in the genus Paeonia, the only genus in the family Paeoniaceae. They are native to Asia, Europe and Western North America. Scientists differ on the number of species that can be distinguished, ranging from 25 to 40, although the current consensus is 33 known species. The relationships between the species need to be further clarified. Most are herbaceous perennial plants 0.25–1 metre (0.82–3.28 ft) tall, but some are woody shrubs 0.25–3.5 metres (0.82–11.48 ft) tall. They have compound, deeply lobed leaves and large, often fragrant flowers, in colors ranging from purple red to white or yellow, in late spring and early summer. All Paeoniaceae are deciduous perennial herbs or shrubs, with thick storage roots and thin roots for gathering water and minerals. Some species are caespitose (tufted), because the crown produces adventitious buds, while others have stolons. They have rather large compound leaves without glands and stipules, and with anomocytic stomata. 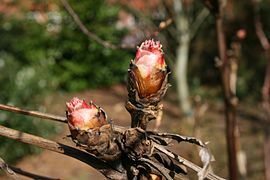 In the woody species the new growth emerges from scaly buds on the previous flush or from the crown of the rootstock. The large bisexual flowers are mostly single at the end of the stem. In P. emodi, P. lactiflora, P. veitchii and many of the cultivars these contributed to, few additional flowers develop in the axils of the leaves. Flowers close at night or when the sky is overcast. Each flower is subtended by a number of bracts, that may form a sort of involucre, has 3-7 tough free sepals and mostly 5-8, but occasionally up to 13 free petals. These categories however are intergrading, making it difficult to assign some of them, and the number of these parts may vary. Within are numerous (50–160) free stamens, with anthers fixed at their base to the filaments, and are sagittate in shape, open with longitudal slits at the outer side and free pollen grains which have three slits or pores and consist of two cells. Within the circle of stamens is a more or less prominent, lobed disc, which is presumed not to excrete nectar. Within the disk is a varying number (1-15) of separate carpels, which have a very short style and a decurrent stigma. Each of these develops into a dry fruit (which is called a follicle), which opens with a lengthwise suture and each of which contains one or a few large fleshy seeds. The annual growth is predetermined: if the growing tip of a shoot is removed, no new buds will develop that season. Paeoniaceae are dependent on C3 carbon fixation. 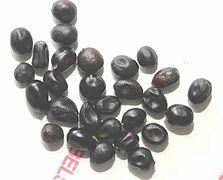 They contain ellagic acid, myricetin, ethereal oils and flavones, as well as crystals of calcium oxalate. The wax tubules that are formed primarily consist of palmitone (the ketone of palmitic acid). The basic chromosome number is five. About half of the species of the section Paeonia however is tetraploid (4n=20), particularly many of those in the Mediterranean region. Both allotetraploids and autotetraploids are known, and some diploid species are also of hybrid origin. The family name "Paeoniaceae" was first used by Friedrich K.L. Rudolphi in 1830, following a suggestion by Friedrich Gottlieb Bartling that same year. The family had been given other names a few years earlier. 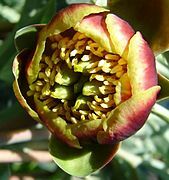 The composition of the family has varied, but it has always consisted of Paeonia and one or more genera that are now placed in Ranunculales. 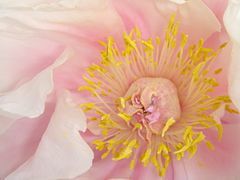 It has been widely believed that Paeonia is closest to Glaucidium, and this idea has been followed in some recent works. Molecular phylogenetic studies, however, have demonstrated conclusively that Glaucidium belongs in the Ranunculaceae family, Ranunculales order, but that Paeonia belongs in the unrelated order Saxifragales. The genus Paeonia consists of about 35 species, assigned to three sections: Moutan, Onaepia and Paeoniae. The section Onaepia only includes P. brownii and P. californicum. The section Moutan is divided into P. delavayi and P. ludlowii, together making up the subsection Delavayanae, and P. catayana, P. decomposita, P. jishanensis, P. osti, P. qiui and P. rockii which constitute the subsection Vaginatae. P. suffruticosa is a cultivated hybrid swarm, not a naturally occurring species. The remainder of the species belongs to the section Paeonia, which is characterised by a complicated reticulate evolution. Only about half of the (sub)species is diploid, the other half tetraploid, while some species both have diploid and tetraploid populations. In addition to the tetraploids, are some diploid species also likely the result of hybridisation, or nothospecies. 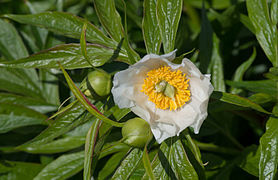 Known diploid taxa in the Paeonia-section are P. anomala, P. lactiflora, P. veitchii, P. tenuifolia, P. emodi, P. broteri, P. cambedessedesii, P. clusii, P. rhodia, P. daurica subsps. coriifolia, daurica, macrophylla and mlokosewitschii. Tetraploid taxa are P. arietina, P. officinalis, P. parnassica, P. banatica, P. russi, P. peregrina, P. coriacea, P. mascula subsps. hellenica and mascula, and P. daurica subsps. tomentosa and wittmanniana. Species that have both diploid and tetraploid populations include P. clusii, P. mairei and P. obovata. P. anomala was proven to be a hybrid of P. lactiflora and P. veitchii, although being a diploid with 10 chromosomes. P. emodi and P. sterniana are diploid hybrids of P. lactiflora and P. veitchii too, and radically different in appearance. P. russi is the tetraploid hybrid of diploid P. lactiflora and P. mairei, while P. cambedessedesii is the diploid hybrid of P. lactiflora, likely P. mairei, but possibly also P. obovata. P. peregrina is the tetraploid hybrid of P. anomala and either P. arietina, P. humilis, P. officinalis, P. parnassica or less likely P. tenuifolia, or one of their (now extinct) common ancestors. P. banatica is the tetraploid hybrid of P. mairei and one of this same group. P. broteri, P. coriacea, P. clusii, P. rhodia, P. daurica subsp. mlokosewitschi, P. mascula subsp. hellenica and ssp. mascula, and P. daurica subsp. wittmanniana are all descendants of hybrids of P. lactiflora and P. obovata. According to recent genetic analyses, the monogeneric family Paeoniaceae is related to a group of families with woody species in the order Saxifragales. This results in the following relationship tree. One dissertation suggests the section Onaepia branches off earliest. A later publication of the same author and others suggests the Moutan-section splits off first. Within that section P. ludlowii and P. delavayi are more related to each other than to any other species. The genus Paeonia naturally occurs in the temperate and cold areas of the Northern Hemisphere. The section Moutan, which includes all woody species, is restricted in the wild to Central and Southern China, including Tibet. The section Onaepia consist of two herbaceous species and is present in the West of North-America, P. brownii between southern British Columbia and the Sierra Nevada in California and eastward to Wyoming and Utah, while P. californica is limited to the coastal mountains of Southern and Central California. The section Paeonia, which comprises all other herbaceous species, occurs in a band stretching roughly from Morocco to Japan. 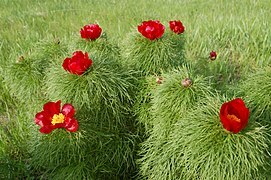 One species of the section Paeonia, P. anomala, has by far the largest distribution, which is also north of the distribution of the other species: from the Kola peninsula in North-West Russia, to Lake Baikal in Siberia and South to the Tien Shan Mountains of Kazakhstan. The rest of the section concentrates around the Mediterranean, and in Asia. 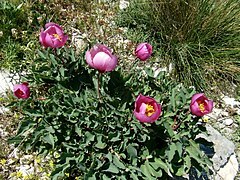 The species around the Mediterranean include Paeonia algeriensis that is an endemic of the coastal mountains of Algeria, P. coriacea in the Rif Mountains and Andalucia, P. cambessedesii on Majorca, P. russoi on Corsica, Sardinia and Sicilly, P. corsica on Corsica, Sardinia, the Ionian islands and in western Greece, P. clusii subsp. clusii on Crete and Karpathos, and subsp. rhodia on Rhodes, P. kesrouanensis in the Western Taurus Mountains, P. arietina from the Middle Taurus Mountains, P. broteri in Andalucia, P. humilis from Andalucia to the Provence, P. officinalis from the South of France, through Switzerland to the Middle of Italy, P. banatica in western Romania, northern Serbia and Slovenia and in southern Hungary, P. peregrina in Albania, western Bulgaria, northern Greece, western Romania, Serbia, Montenegro and Bosnia, while P. mascula has a large distribution from Catalonia and southern France to Israel and Turkey. 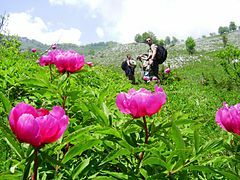 Between the two concentrations, the subspecies of Paeonia daurica occur, with subspecies velebitensis in Croatia, and daurica in the Balkans and Crimea, while the other subspecies coriifolia, macrophylla, mlokosewitschii, tomentosa and wittmanniana are known from the Caucasus, Kaçkar and Alborz Mountains. Paeonia emodi occurs in the western Himalayas between Pakistan and western Nepal, P. sterniana is an endemic of southeastern Tibet, P. veitchii grows in Central China (Qinghai, Ningxia, Gansu, Shaanxi, Shanxi, Sichuan and the eastern rim of Tibet), like P. mairei (Gansu, Guizhou, Hubei, Shaanxi, Sichuan, and Yunnan), while P. obovata grows in warm-temperate to cold China, including Manchuria, Korea, Japan, Far Eastern Russia (Primorsky Krai) and on Sakhalin, and P. lactiflora occurs in Northern China, including Manchuria, Japan, Korea, Mongolia, Russia (Far East and Siberia). The species of the section Paeonia have a disjunct distribution, with most of the species occurring in the Mediterranean, while many others occur in eastern Asia. Genetic analysis has shown that all Mediterranean species are either diploid or tetraploid hybrids that resulted from the crossbreeding of species currently limited to eastern Asia. The large distance between the ranges of the parent species and the nothospecies suggest that hybridisation already occurred relatively long ago. It is likely that the parent species occurred in the same region when the hybrids arose, and were later exterminated by successive Pleistocene glaciations, while the nothospecies remained in refugia to the South of Europe. During their retreat P. lactiflora and P. mairei likely became sympatric and so produced the Himalayan nothospecies P. emodi and P. sterniana. Over 262 compounds have been obtained so far from the plants of Paeoniaceae. These include monoterpenoid glucosides, flavonoids, tannins, stilbenoids, triterpenoids, steroids, paeonols, and phenols. In vitro biological activities include antioxidant, antitumor, antipathogenic, immune-system-modulation activities, cardiovascular-system-protective activities and central-nervous-system activities. Ancient Chinese texts mention the peony was used for flavoring food. Confucius (551–479 BC) is quoted to have said: "I eat nothing without its sauce. I enjoy it very much, because of its flavor." Peonies have been used and cultivated in China since early history. Ornamental cultivars were created from plants cultivated for medicine in China as of the sixth and seventh century. Peonies became particularly popular during the Tang dynasty, when they were grown in the imperial gardens. In the tenth century the cultivation of peonies spread through China, and the seat of the Sung dynasty, Luoyang, was the centre for its cultivation, a position it still holds today. A second centre for peony cultivation developed during the Qing dynasty in Cáozhōu, now known as He Ze. Both cities still host annual peony exhibitions and state-funded peony research facilities. Before the tenth century, P. lactiflora was introduced in Japan, and over time many varieties were developed both by self fertilisation and crossbreeding, particularly during the eighteenth to twentieth centuries (middle Edo to early Shōwa periods). During the 1940s Toichi Itoh succeeded in crossing tree peonies and herbaceous peonies and so created a new class of so-called intersectional hybrids. Although P. officinalis and its cultivars were grown in Europe from the fifteenth century on, originally also for medicinal purposes, intensive breeding started only in the nineteenth century when P. lactiflora was introduced from its native China to Europe. The tree peony was introduced in Europe and planted in Kew Gardens in 1789. The main centre of peony breeding in Europe has been in the United Kingdom, and particularly France. Here, breeders like Victor Lemoine and François Félix Crousse selected many new varieties, mainly with P. lactiflora, such as "Avant Garde" and "Le Printemps". The Netherlands is the largest peony cut flower producing country with about 50 million stems each year, with "Sarah Bernhardt" dominating the sales with over 20 million stems. herbaceous: During summer, renewal buds develop on the underground stem (the "crown"), particularly at the foot of the current season's annual shoots. These renewal buds come in various sizes. Large buds will grow into stems the following growing season, but smaller buds remain dormant. The primordia for the leaves can already be found in June, but the flower only starts differentiating in October, as the annual shoots die down, completing its development in December, when sepals, petals, stamens and pistils are all recognisable. tree: During the summer, large buds develop at the tip of the annual growth and near its foot. In the autumn, the leaves are shed, and the new stems become woody and are perennial. 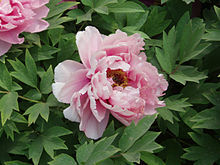 Itoh (or "Intersectional"): In 1948 horticulturist Toichi Itoh from Tokyo used pollen from the yellow tree peony "Alice Harding" to fertilize the herbaceous P. lactiflora "Katoden", which resulted in a new category of peonies, the Itoh or intersectional cultivars. These are herbaceous, have leaves like tree peonies, with many large flowers from late spring to early autumn, and good peony wilt resistance. Some of the early Itoh cultivars are "Yellow Crown", "Yellow Dream", "Yellow Emperor" and "Yellow Heaven". Herbaceous peonies such as Paeonia lactiflora, will die back to ground level each autumn. Their stems will reappear the following spring. 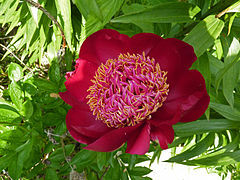 However tree peonies, such as Paeonia suffruticosa, are shrubbier. They produce permanent woody stems that will lose their leaves in winter but the stem itself remains intact above ground level. 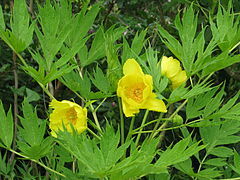 The herb known as Paeonia, in particular the root of P. lactiflora (Bai Shao, Radix Paeoniae Lactiflorae), has been used frequently in traditional medicines of Korea, China and Japan. 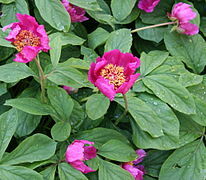 In Japan, Paeonia lactiflora used to be called ebisugusuri ("foreign medicine"). Pronunciation of 牡丹 (peony) in Japan is "botan." In kampo (the Japanese adaptation of Chinese medicine), its root was used as a treatment for convulsions. It is also cultivated as a garden plant. In Japan Paeonia suffruticosa is called the "King of Flowers" and Paeonia lactiflora is called the "Prime Minister of Flowers." In China, the fallen petals of Paeonia lactiflora are parboiled and sweetened as a tea-time delicacy. Peony water, an infusion of peony petals, was used for drinking in the Middle Ages. The petals may be added to salads or to punches and lemonades. The peony is among the longest-used flowers in Eastern culture. Along with the plum blossom, it is a traditional floral symbol of China, where the Paeonia suffruticosa is called 牡丹 (mǔdān). It is also known as 富貴花 (fùguìhuā) "flower of riches and honour" or 花王 (huawang) "king of the flowers", and is used symbolically in Chinese art. In 1903, the Qing dynasty declared the peony as the national flower. Currently, the Republic of China government in Taiwan designates the plum blossom as the national flower, while the People's Republic of China government has no legally designated national flower. In 1994, the peony was proposed as the national flower after a nationwide poll, but the National People's Congress failed to ratify the selection. In 2003, another selection process has begun, but to date, no choice has been made. The ancient Chinese city Luoyang has a reputation as a cultivation centre for the peonies. Throughout Chinese history, peonies in Luoyang have been said to be the finest in the country. Dozens of peony exhibitions and shows are still held there annually. In the Middle Ages, peonies were often painted with their ripe seed-capsules, since it was the seeds, not the flowers, which were medically significant. Ancient superstition dictated that great care be taken not to be seen by a woodpecker while picking the plant's fruit, or the bird might peck out one's eyes. Peonies are a common subject in tattoos, often used along with koi-fish. The popular use of peonies in Japanese tattoo was inspired by the ukiyo-e artist Utagawa Kuniyoshi's illustrations of Suikoden, a classical Chinese novel. His paintings of warrior-heroes covered in pictorial tattoos included lions, tigers, dragons, koi fish, and peonies, among other symbols. The peony became a masculine motif, associated with a devil-may-care attitude and disregard for consequence. Famous painters of peonies have included Conrad Gessner (ca. 1550) and Auguste Renoir in 1879. Paeonia officinalis can be found in the altar picture of Maria im Rosenhag by Schongauer in the former Dominican Church in Colmar. The Italian Jesuit, painter and architect Giuseppe Castiglione (1688-1766), who worked at the court of the Qianlong Emperor in the Qing dynasty, painted peonies. ^ Angiosperm Phylogeny Group (2009). "An update of the Angiosperm Phylogeny Group classification for the orders and families of flowering plants: APG II" (PDF). Botanical Journal of the Linnean Society. 161 (2): 105–121. doi:10.1111/j.1095-8339.2009.00996.x. Retrieved 2013-07-06. 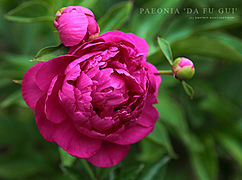 ^ The Concise Oxford English Dictionary (twelfth edition, 2011) lists 'paeony' as a variant spelling of 'peony'. ^ a b c Halda, Josef J.; Waddick, James W. (2004). The genus Paeonia. Oregon, USA: Timber Press. ^ a b Tamura, Michio (2007). "Paeoniaceae". In Klaus Kubitski. The Families and Genera of Vascular Plants. IX. Berlin, Heidelberg, Germany: Springer-Verlag. pp. 265–269. ^ Deyuan, Hong; Kaiyu, Pan; Turland, Nicholas J. (2001). Flora of China (PDF). 6. pp. 127–132. Retrieved 2016-05-10. ^ a b c d e Kamenetsky, Rina; Dole, John (2012). "Herbaceous Peony (Paeonia): Genetics, Physiology and Cut Flower Production" (PDF). Floriculture and Ornamental Biotechnology. 6 (Special Issue 1): 62–77. Retrieved 2016-04-29. ^ "'The industry's about to explode': Peony market flourishes in Alaska". Anchorage Daily News. 2018-08-05. Retrieved 2019-01-10. ^ a b c "Saxifragales". ANGIOSPERM PHYLOGENY WEBSITE. Retrieved 2016-04-26. ^ David J. Mabberley. 2008. Mabberley's Plant-Book.Cambridge University Press: UK. ^ Wang, Wei; Lu, An-Ming; Ren, Yi; Endress, Mary E.; Chen, Zhi-Duan (2009). "Phylogeny and Classification of Ranunculales: Evidence from four molecular loci and morphological data". Perspectives in Plant Ecology, Evolution and Systematics. 11 (2): 81–110. doi:10.1016/j.ppees.2009.01.001. ^ a b Jian, Shuguang; Soltis, Pamela S.; Gitzendanner, Matthew A.; Moore, Michael J.; Li, Ruiqi; Hendry, Tory A.; Qiu, Yin-Long; Dhingra, Amit; Bell, Charles D.; Soltis, Douglas E. (2008). "Resolving an Ancient, Rapid Radiation in Saxifragales". Systematic Biology. 57 (1): 38–57. doi:10.1080/10635150801888871. PMID 18275001. ^ a b Ji, Li Jing; Wang, Qi; Teixeira da Silva, Jaime A.; Yu, Xiao Nan (2012). "The genetic diversity of Paeonia L.". Scientia Horticulturae. 143: 62–74. doi:10.1016/j.scienta.2012.06.011. ^ a b c Sang, Tao; Crawford, Daniel J.; Stuessy, Tod F. (1995). "Documentation of reticulate evolution in peonies (Paeonia) using internal transcripted spacer sequences of nuclear ribosomal DNA: Implications for biogeography and concerted evolution". Proceedings of the National Academy of Sciences of the United States of America. 92 (15): 6813–6817. doi:10.1073/pnas.92.15.6813. PMC 41419. PMID 7624325. ^ Sang, Tao (1996). Phylogeny and Biogeography of Paeonia (PAEONIACEAE), dissertation. The Ohio State University. cited on "Tao Sang, DISSERTATION, chapter 4". Paeon. Retrieved 2016-05-19. ^ Sang, T.; Donoghue, M.J.; Zhang, D. (1997). "Evolution of alcohol dehydrogenase genes in peonies (Paeonia): phylogenetic relationships of putative nonhybrid species". Molecular Biology and Evolution. 14 (10): 994–1007. doi:10.1093/oxfordjournals.molbev.a025716. PMID 9335140. Retrieved 2016-05-19. ^ Flowers in Greek Mythology, VALENTINE floral creations. Accessed 23 June 2008. ^ He, C.-N.; Peng, Y.; Zhang, Y.-C.; Xu, L.-J. ; Gu, J.; Xiao, P.-G. (2010). "Phytochemical and Biological Studies of Paeoniaceae". Chemistry & Biodiversity. 7 (4): 805–838. doi:10.1002/cbdv.200800341. PMID 20397219. ^ Subhuti Dharmananda. "White peony, red peony, and moutan: Three Chinese Herbs Derived from Paeonia". Institute for Traditional Medicine. Retrieved 2016-05-03. ^ Pauwels, I.; Vervoort, G. (2009). Pioenen [Peonies] (1: in volle glorie [in full splendor] ed.). Uitgever Lannoo Uitgeverij. p. 143. ISBN 978-9020965070. ^ Coit, J. Eliot (1908). "Peony". Bulletin. 259: 104. ^ "Peony". Royal Horticultural Society. ^ "How to Plant Peonies". ^ Sasaki, Sanmi. 2005. Chado: The Way of Tea: A Japanese Tea Master's Almanac. Translated from the Japanese by Shaun McCabe and Iwasaki Satoko. Boston: Tuttle. Page 247. ^ "Getting to know peonies' symbolism - part 2". Bloomthis. ^ Terese Tse Bartholomew, Hidden Meanings in Chinese Art (San Francisco: Asian Art Museum/Chong-Moon Lee Center for Asian Art and Culture), 2006. ^ a b Walter Good. "The World of the Peony". ^ Sowerby, James & John Edward. 1899. Ranunculaceae to Cruciferae. London: George Bell & Sons. Page 69. ^ Natalia. "A Pilgrimage to Kosovo Today". Serbian Orthodox Church. Retrieved 21 April 2018. ^ "Peony". State Symbols USA. Retrieved 21 April 2018. 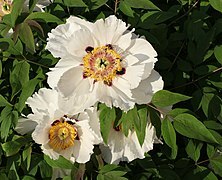 ^ "HPS Frequently Asked Questions: Ants on Peonies". Heartland Peony Society. Retrieved 2010-05-02. This page was last edited on 16 February 2019, at 14:35 (UTC).